Many years ago, when I was but a lad, my best friend came into possession of the newly published Second Edition Advanced Dungeons & Dragons rulebooks. We were fascinated by the system and the concept, and I wanted my own copies. At Waldenbooks an employee suggested I might want to start with the Dungeons & Dragons Basic Set, which would be an easier introduction to the game. I bought it, and the rest was history. It's because of that choice that instead of Faerun, Oerth or Krynn my favored game world, the one that I return to time and again, is Mystara. Over the years, I played and ran a lot of games of Dungeons & Dragons set in Mystara (originally just called The Known World) and I built up a large collection of adventure modules and supplements. I had come in at the perfect time, as TSR had recently begun to actively detail the setting through a series of Gazetteers that detailed each of the major nations of Mystara in turn. 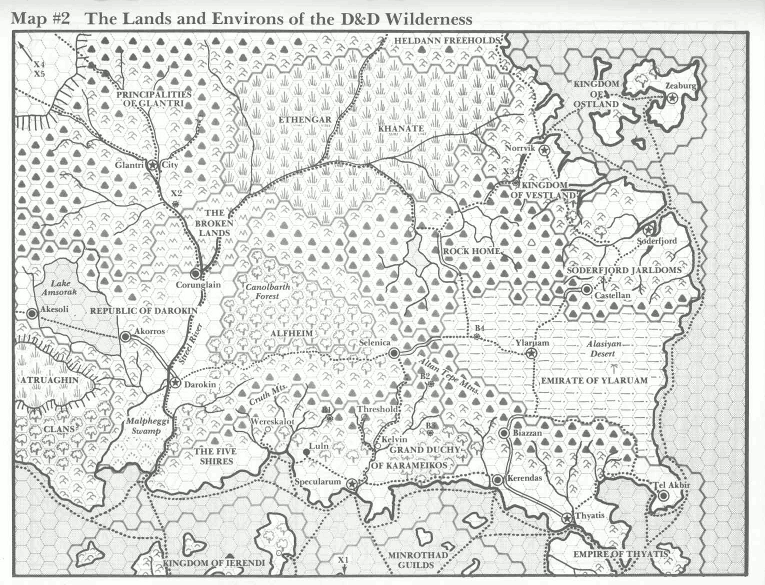 Dave Arneson's Blackmoor setting was incorporated as the distant past of Mystara, prior to a great nuclear apocalypse. The world was revealed as hollow, with ancient extinct civilization preserved within. The great airship Princess Ark crossed the world and even reached the moon (which is populated by samurai cat people). A worldwide calamity stripped Mystara of magic for a full week. Eventually TSR decided to retire the Dungeons & Dragons rule set and only support Advanced Dungeons & Dragons. For a short period, Mystara continued to be supported and new AD&D supplements were released for it. After only a few however, Mystara was retired as well. It's mentioned every so often in newer editions, most recently in the 5th edition books as one of many campaign worlds that exist, but there hasn't been an official Mystara supplement published since 1995. Every Monday I plan to bring out an item from my collection and show it off a bit. I'll talk about what it is, where it fits into the setting as a whole, and maybe tell a few stories about games past. Next week I'll be starting with the very first Dungeons & Dragons books I ever owned, the Dungeons & Dragons Basic Rules.